A leading offshore company has been fined £60,000 for health and safety failings on a North Sea platform which led to a gas cylinder striking three technicians. One of those injured had his legs shattered and the company was yesterday told its errors could have led to the death of workers. The Brent Delta Platform, managed by Shell, used gas canisters to spray water in the event that a fire broke out. These would be replaced while empty when they needed to be recharged. In early 2014, however, the company ordered two replacement cylinders from supplier Tyco but rather than receiving empty ones received two full of nitrogen gas. Protocol dictated these should have been kept in a safe place, only for one to be introduced into use in July. In November that year Wood Group employee Stuart MacKenzie went to replace an existing cylinder and picked up one of the new ones containing nitrogen. He realised it was not what he was looking for and put it down with the intention of going to seek instruction, but in doing so he accidentally triggered it and the contents were released. The cylinder and valve became projectiles, seriously injuring Mr MacKenzie and also striking Bradley Nicolson and Paul Cunningham. The company admitted to breaches of health and safety legislation between July and November 2014 during an appearance at Aberdeen Sheriff court yesterday. She added that Mr MacKenzie had been in Aberdeen Royal Infirmary for a week with his injuries. He then had to return at a later date for an operation and had been unable to return to work offshore. The court also heard that Mr Nicholson had needed physiotherapy for a hand injury. Mr Cunningham did not sustain an injury. Representing the company, defence agent Rona Jamieson said they had accepted responsibility. She said it had a good health and safety record and the platform in question had won an award for this at the Oil and Gas UK Awards in 2003. Imposing a fine, Sheriff Jack Brown said the level of culpability Shell bore for the incident was medium and accepted it had pled guilty at an early opportunity. Duncan Manning, Brent Asset Manager at Shell, insisted safety was “a top priority”. He said: “Shell deeply regrets the accident and the injuries sustained by the individuals involved. “We work in a hazardous environment where safety is our top priority. 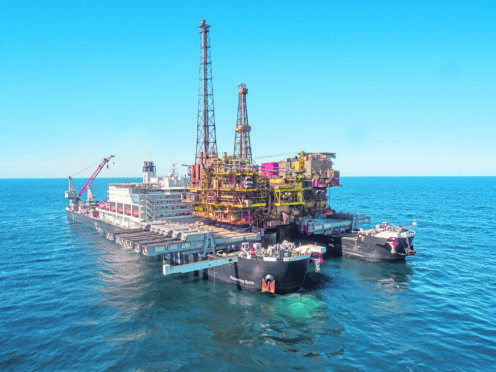 “Shell is determined to deliver safe operations in all phases from production through to decommissioning to ensure that everyone returns home safely at the end of the day. The incident was reported to the Crown in 2016 after an extensive investigation by the Health and Safety Executive (HSE). Following the outcome of the case, HSE inspector David Josiah said companies that fell below required standards would face action. He said: “This incident could so easily have been avoided by simply carrying out correct control measures and safe working practices.